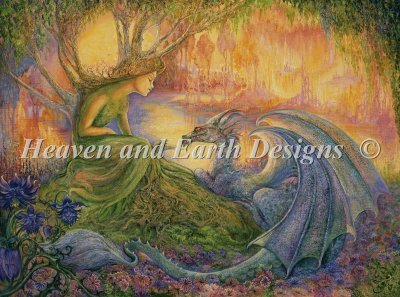 So I had purchased the Dryad and the Dragon chart last year and then this year, during the HAED sale on kits, I ordered the fabric and threads. And it arrived! The kit also came with a cute needle threader and needle holder and I also asked for some cardboard bobbins and 5 needles. The little notes and ribbons are very nice. The fabric was wrapped in tissue paper and is an eggshell white. The floss is beautiful and a little daunting considering I usually do pieces with maximum 20 colours and this one has more than 80. The threads look so beautiful together and I am really excited to bobbin them all up and look at how many greens, blues and oranges I have. No all I have to do is finish up the salmon, get dowels that will fit the fabric and my scroll frame and grid the fabric and I will be ready to start. This was a super fun package to receive with everything nicely wrapped and nice notes all over.